IPC solutions let you gather and disperse information, plan action and respond to any situation more quickly and effectively than ever before possible. Envision coordinated, near-instantaneous communication across any mix of voice technologies - landline, radio or gateway with advanced features no other systems can deliver. IPC offers a range of solutions to meet the unique needs of today's dispatch centers. Whether handling incoming E911 calls or communicating with first responders, dispatchers must have complete control of multiple forms of communications. IPC offers a number of Radio Dispatch solutions that let you gather and disperse information, plan action and respond to any situation more quickly and effectively than ever before. IPC's Primet Series Controllers provide the perfect solution for smaller dispatch centers. Ideal for communities having mostly conventional radio requirements and only a few dispatch positions, the Primet Series utilizes a redundant architecture to ensure that the system is always running. Available in one position and two position versions, the Primet Series comes equipped with everything needed to begin operating immediately. At the core of any well managed dispatch center is a command system that is fully featured, always available and easy to use. The T5 Communications Control System from IPC provides a robust platform that meets current requirements and provides a growth path to new and emerging technologies. Based on a fault tolerant architecture, the T5 provides leading edge capabilities for both telephony and radio communications. The TDM Communications Controller provides the perfect solution for smaller dispatch centers that want to have many of the advantages inherent in our more advanced systems. Ideally suited for two to five operator positions that need to support conventional analog radio, the TDM Series is based on a robust platform with a proven fault tolerant architecture. IPC's console products provide fingertip control of all the resources necessary to quickly and accurately manage the myriad of communications systems in an advanced dispatch center. The Resource is a full featured user interface that centralizes all system components by providing one click control through an intuitive user interface. Users can configure the interface to match their unique needs and work style including screen layout, colors and even the order in which resources are displayed. IPC's E-911 system offers emergency call takers the ability to handle emergency calls no matter the source. Already NENA Phase II compliant, the E-911 system provides a cost effective upgrade to your existing infrastructure. Modular in design, the system offers a variety of line configurations and a host of functions that make IPC the premier provider of E-911 systems available today. Operators in command centers need access to a myriad of information. Traditionally, command centers have had to rely on multiple systems just to get the job done right. IPC's IQMX delivers unsurpassed functionality providing one button access to telephone lines, radio channels, intercom, speed dials and advanced voice features enabling the users to quickly establish communications between one or more parties. Designed as a multimedia IP console, the IQMX brings voice, data and video applications together directly to the desktop. IPC's ICMX Intercom enables firms to extend their communications beyond their turret users. 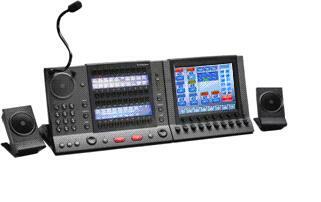 The ICMX provides a single communications tool for broadcast, private lines, intercom and standard dial tone, eliminating the need for multiple devices. Additionally, the ICMX seamlessly connects with IPC desktops. Firms select the Slimline TDM turret when they need a compact solution to provide their users' with instant access to important client lines. The ergonomic interface of the Slimline supports two handsets and the addition of eight channel speaker modules to ensure users are always in touch with the people and information they need. The IQMX is one of the world's first IP desktops and extends the functionality of the Alliance MX switch beyond the physical trading floor. Enterprise functionality is maximized with the IQMX allowing for business continuity solutions that are flexible, cost effective and easy to manage. The IQMX takes advantage of all Alliance MX capabilities, including integration with PCs for Enterprise Hoot and Intercom, and mobility to any geographical location. The modules are designed to work together, creating a consolidated desktop that maximizes efficiency through the integration of voice and applications. The IQMX Control Module is the essential building block of the IQMX desktop. The Module has been ergonomically designed for complete ease of use. The Module gives users controls for two handsets, a telephone keypad, ten soft keys and 30 dynamic buttons per page. The control module can give the user access to 600 lines. The IQMX Application Module brings the desktop to a new level of capability. This desk-based platform delivers the benefits of integration between disparate hardware and software systems that exist in the communications environment. The Module provides the user with extra buttons and speakers as well as enhancing the communication function via the interactive video-quality touchscreen. IQMX Button Module consists of 30 dynamic buttons per page, access to 600 lines across 30 pages and an integrated 8-channel speaker module. Up to three Button modules may be added to a single IQMX trading position. Built with the finest sound quality, the IQMX Speaker Module consists of four programmable channels, volume control knobs and a speaker. Additional speaker modules may be added to support up to 16 channels per desk. © 2005, Brockmann Electronics, LLC. All rights reserved.